Anything your pet can dribble or excrete will probably end up on your furniture at some point. While you can machine wash cushion covers, slipcovers and throw rugs, strong smells often permeate the sofa cushions and leave a nasty lingering odor behind. You don't have to resort to harsh chemicals to remove these unpleasant scents. With a little help from some simple homemade cleaning solutions, you can neutralize pet odors and leave your couch smelling fresh and fragrant. Baking soda and white vinegar help neutralize pet odors. Before you begin, take the cushions outdoors and give them a smack to remove any loose debris. If they have covers, take those off and place them in the washing machine along with a generous tablespoon of baking soda, and then follow the washing instructions written on the care label. 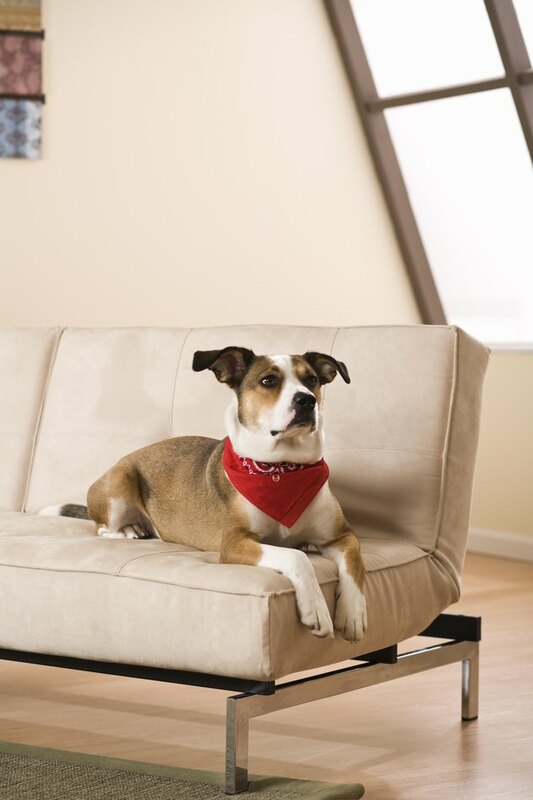 Vacuum the couch and cushions using the upholstery attachment and crevice tool, paying particular attention to hard-to-reach areas where fur accumulates. If possible, flip the couch over and vacuum the underside. Make sure you vacuum the floor beneath the couch as well, because this is where hairballs tend to gather. Baking soda is a powerful, environmentally friendly odor remover, especially when it's teamed with white vinegar. To create a cleaning solution, pour 2 cups of white distilled vinegar and 2 cups of lukewarm water into a large bowl, and then slowly add 4 tablespoons of baking soda. Pour the solution into a spray bottle and spray a light layer over your couch. Alternatively -- if you don't have a spray bottle -- dip a cloth into the solution and wipe down the upholstery with it. Whichever method you choose, let the solution sit for around five minutes, and then blot or rub your couch with a clean dry cloth to remove excess moisture. Although baking soda can neutralize pet odors, it may not completely eliminate the more potent smells. To create a stronger scented cleaning solution, mix together 3/4 cup of 3 percent hydrogen peroxide and 1 teaspoon of dish detergent. Sprinkle baking soda over the affected area, and then dampen a cloth with the cleaning solution and use it to work the baking soda into the couch. Wait for the affected area to dry, and then vacuum away the excess baking soda. If your pet has urinated on the couch, use paper towels or newspaper to soak up as much as possible before it dries -- the more you can remove, the less odor you'll need to oust. Lay a thick layer over the soiled spot; pat it down, and keep repeating the process until you can no longer soak up any moisture. As a preventative measure, place the fresh urine-soaked paper into your pet's designated bathroom area to encourage conducting business there, rather than the couch. If the scent of urine still remains after you use homemade cleaning solutions, use a commercial pet specific scented odor neutralizer -- available at pet stores. Specialized odor removers usually contain enzymes that will break down the urine and completely eliminate the smell. If you use a commercial product, follow the instructions specified on the container. Potty training is the most effective long-term solution; however, it's not always the most viable short-term solution. According to Royal Pet Vet, dogs find the smell of orange and lemon distasteful and will generally avoid areas where the scent of citrus fruits is prominent. Mix a few drops of pure lemon juice with your cleaning solution to create a natural pet deterrent. In addition, while you're potty training your pet, place slipcovers or blankets over the upholstery to form a protective barrier. When using homemade cleaning solutions, never add essential oils to the mixture or use air freshener sprays to perfume your couch after neutralizing the smell -- unless they are nontoxic. While they may be safe for humans, they could be harmful for animals. Always test your cleaning solution for color fastness by applying a small amount to an inconspicuous area of your couch. Linnea Andreasson is a professional interior designer and Japanse decor enthusiast. She earned her Bachelor of Arts degree in 3D and interior design from the University of Essex in 2011. In her spare time she builds custom tatami furniture and writes on her decor blog, Shoji Secrets.